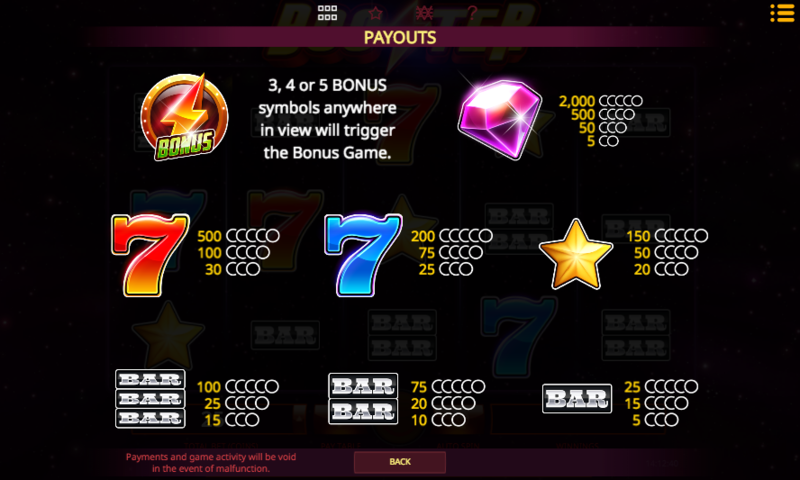 There’s a back-to-basics feel to this online slot machine from iSoftBet with it’s traditional symbols and pared-back design but it also comes with a range of bonuses: it’s called Booster and you can find out how it all works right here. 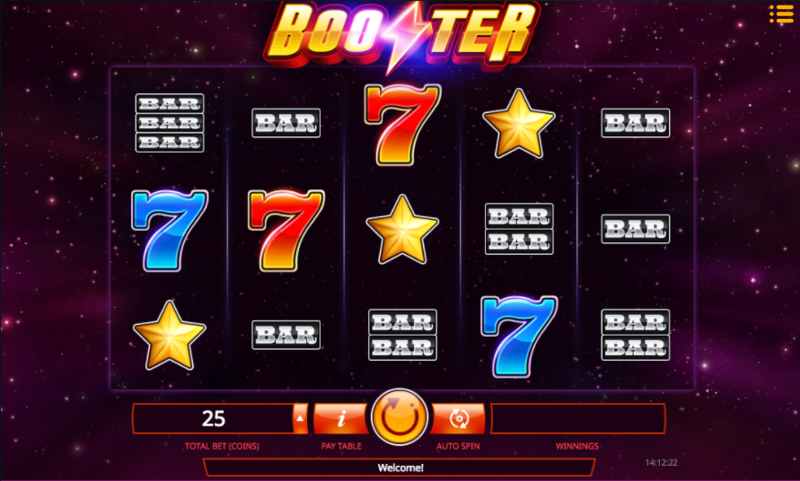 Booster is a five reel slot with three rows and twenty five fixed paylines; those reels are transparent and through them there’s a scene of moving stars which makes us feel as though we’re on the Starship Enterprise. We said the symbols were traditional and here’s the proof – we have red sevens, blue sevens, a gold star, single/double/triple bars and a pink diamond. The latter is the most valuable and worth 2000x your line stake for five on an active payline. There’s no wild symbol in play here but there is a bonus icon which is an orange lightning flash that activates the main feature. Five free spins + 5x multiplier. Ten free spins + 2x multiplier. Ten free spins + 3x multiplier. Fifty free spins + 2x multiplier. A random award of 3-50 spins + a multiplier of 1x-5x or a coin award of up to 6000. It’s not possible to trigger the feature again from within this round but any bonus symbol landing will still pay a scatter prize. Booster is another very playable slot from iSoftBet with some smooth, colourful gameplay and a soundtrack to match; will you win 100 free spins or just 15? There’s only one way to find out! This game comes with a nice high RTP of 97.40%.